As the temperature is becoming cooler by the day, many people are spending more time in their homes than over the summer months. With Christmas not too far away, you may well be thinking about making some home improvements to make your home the very best it can be to share the festive time with your friends and family and create special memories together. The first room of your house that any guests will see and use is of course, your hallway. Some people say that a hallway is not a real room of your home and whilst this may be true, first impressions count and as the hallway is the first place people coming into your home will be, it makes sense to make the most of the space. You want your hallway to be as welcoming as possible and as it is somewhere that you will be using every day as well, it needs to be a space that is functional as well as stylish. 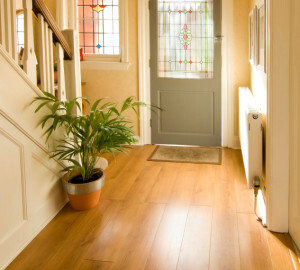 For many of our customers, making a change from having a carpeted hallway to an oak floor in their hall is an easy decision for more than just the beautiful appearance that oak flooring brings to your home. Having oak flooring in your home will have many benefits that include health benefits as well as things like making cleaning the floor a quicker household activity than having to shampoo and hoover carpets – oak flooring is great if you have dogs as well – easy clean up after muddy winter walks! You can choose a whole selection of finishes for your oak flooring, from unfinished solid oak flooring that you can finish on site to your own taste, to an engineered oak floor with a lacquered finish, through to a vintage hand scraped finish. You have the flexibility to choose the finish of your oak flooring to perfectly complement your style and décor and give your home a look that is unique to you. We have a range of solid oak flooring available to order that is a simply stunning addition to any room in your home, including the hallway, and will create a welcoming feel to all those who visit your home. We have some finishes that are exclusive to our engineered oak flooring range and if you’re not sure if you are looking for slid oak flooring or engineered oak flooring, we have a handy guide which will explain the key differences and benefits of these two types of flooring. If you would like to have a cosy warm home for the winter time, underfloor heating is perfect for you and is sure to be a hit with everyone who feels the warmth under their feet on a cold winter day. Imagine how nice it would be to come home, kick off your shoes and feel the warmth from the floor in your hallway to welcome you back! Underfloor heating is a true luxury. Our wide range of engineered oak flooring is suitable for underfloor heating and we also have a revolutionary ThruFlow underfloor heating system that will keep your floors warm when the temperature outside is low. If you would like to learn more about our ThruFlow under floor heating system, what the requirements are and how it works, please call us today on 0800 043 3073 or email sales@oakfloorsonline.co.uk and we’d be happy to tell you more. Whatever kind of oak floor is the right one for your home and whichever finish you choose, having a high quality floor that is bespoke to your taste and that complements your style and décor is always going to be an excellent way to create the right impression for guests who are visiting and to make your hall way more than simply space in your house, it will become a room of your home.